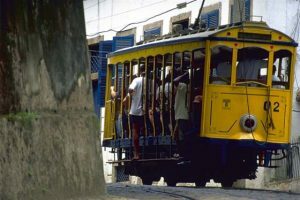 RIO DE JANEIRO, BRAZIL – The announcement made by the state government’s Chief Secretary of Staff, Regis Fichtner, that the bonde, Santa Teresa’s tram system, will be relaunched in 2014 has been criticized by the Association of Residents and Friends of Santa Teresa (AMAST). Lawyer Abaeté Mesquita, one of AMAST’s directors, has stated that the works announced by Fichtner represent only what the public authorities are duty bound to do, and nothing more. The Santa Teresa bonde before being shut down, photo by Brenomendes/Wikimedia Creative Commons License. The bonde was taken out of operation following an accident on August 27, 2011 which left six people dead and 54 people injured only two months after a French tourist fell to his death from a bonde crossing the Arcos da Lapa. The plans announced on Friday, February 24th are expected to lead to the bonde reopening in March 2014 and could see a new line introduced between Silvestre and Corcovado. Mesquita has expressed concern over this planned extension, as the link to Corcovado and its train which takes tourists to the Cristo Redentor (Christ the Redeemer) statue, could greatly increase the number of tourists using it, which will have fewer spaces than the traditional bonde. The decision to ban people from standing on the fourteen new bonde cars will further reduce their capacity. Emily Holmes, a UK-born resident of Santa Teresa is also concerned about the impact that emphasizing the bondes’ appeal to tourists will have on the price and the community. 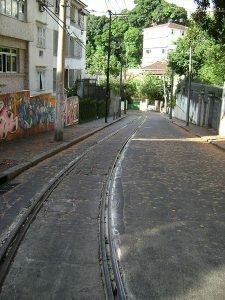 The bonde tracks, photo by Andrevruas/Wikimedia Creative Commons License. “If the bonde returns at a higher price certain people will be excluded from using it and this will change its charm.” She explains. Elzbieta Mitkiewicz, the President of AMAST, has criticized the delay in reopening the bonde lines. Mitkiewicz has also questioned the lack of communication between the authorities and the residents of Santa Teresa, where the bonde has been the principal form of transport for 115 years. The CEO of Central, the company responsible for the management of the bonde network, has stated that the call for tenders for the construction of the bondes will be national. However the Portuguese company Carris, which manages the tram system in Lisbon, will act as a consultant on the revitalization of the Santa Teresa bonde system. This decision has also been criticized by Abaeté Mesquita, who claims that the process which led to Carris being awarded the consultancy contract was not conducted transparently and that a Brazilian company could carry out the same job at a lower price. As someone who lives at the foot of Santa Teresa, I would love to see the bonde reintroduced as soon as possible. But saying the bus is “so expensive” at 70 centavos is one of the most ridiculous things I’ve heard. Any person who makes comments about prices should know what they´re talking about. If you have a large family and have never paid this price before, you spent it on more urgent basics. Therefore, for THEM, it is expensive and lucky for the person commmenting that HE doesn´t have to worry about cents.As a person who has known and travelled on every public transport I have become used to the fcat that the authorities almost NEVER communicate or ask the opinion of the population who uses the transport. Mr. Julio Lopes isn´t the most popular characteraround. I wonder why? Since all other city buses are now R$2.75, you would be still be lucky to pay R$0.70. No matter your economic situation, that’s a pretty good deal for transportation. Prices are going to rise over time, and a R$0.10 increase of an already underpriced fare could be a lot worse. @ Eric, I think you do not understand, bus price in Santa Teresa is actually R$2.75, which is a lot considering the length of the route and the fact that you have to take a second transport if you want to get anywhere further than Centro. This figure is even more absurd if you are only travelling locally, which is normally needed due to local geography. The buses at R$0.70 where introduces as a replacement for the bondes, but they are barely there running in over 60min intervals for the longest and highest route of the borough. I’ve grown up in Santa Teresa and the bonde for us is part of our culture, our lifestyle, way of life etc. Without it Santa Teresa doesn’t feel the same. Taking the bonde to Centro on a hot Summer day is far more pleasant than taking the bus, you will not arrive at work sweaty or stressed and you might even arrive earlier because the Avenida Chile is always packed with cars. Again, after a hard day, making you way back on the bonde is very relaxing. On other note I think AMAST sometimes have to give in a tiny bit, I understand that due to safety some sits were taken out of the project, although they will have to put bondes every 10 mins to compensate for the lost sits. Probably to reserve fewer sits only for tourist and charge a much higher price to them, it is really bad to arrive at the bonde station and not be able to get in because the tourists took all the places, and the next in in one hour. The bonde for us Santa Teresa dwellers, is not a touristic luxury, it is our public transport.